The “study” as I call it–I hardly call it, but when I do, I use this term–has existed since 2007. It was built for me by my husband in a carefully bartered, seemingly-fair trade for the baby-carrying I was doing that year. 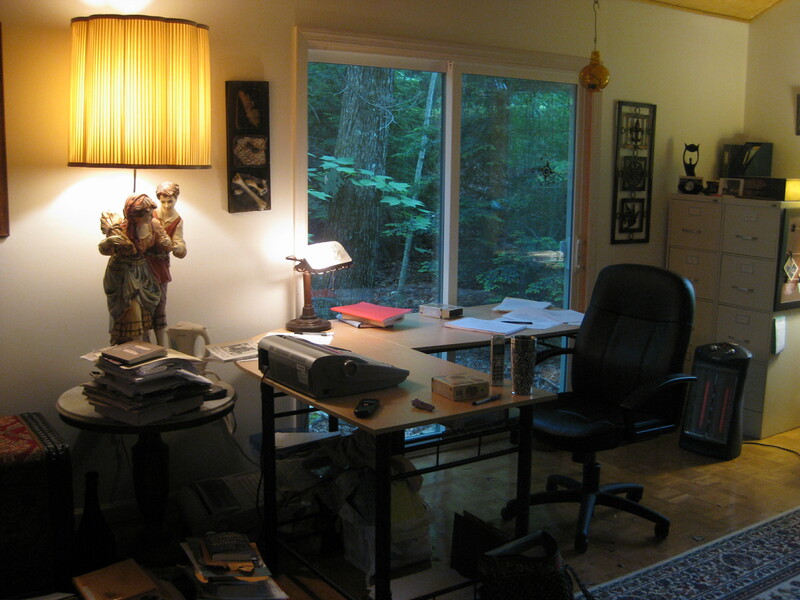 How big (ish) is your little writing house? Amenities? (electric/water/heat/private parking/whirlpool tub) Where is it? 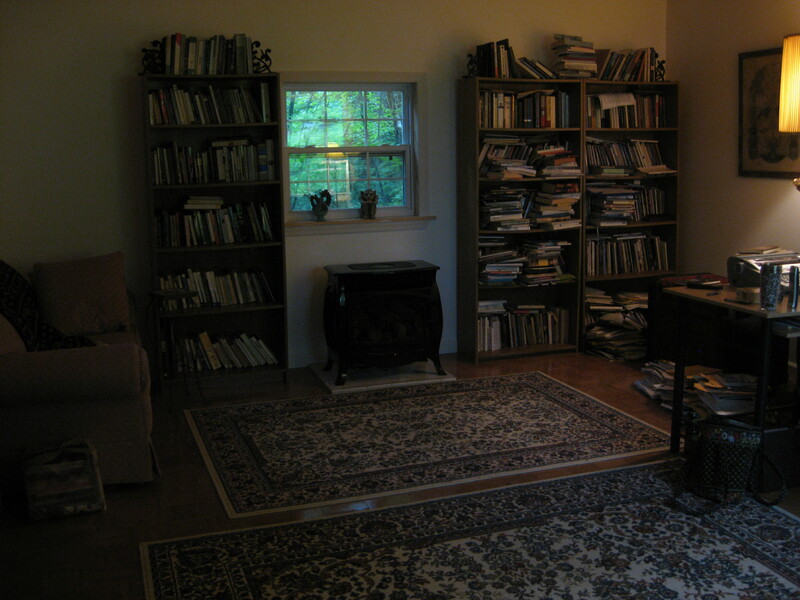 When I asked, I was told it was 16 by 20 feet, but to me it is two desks and three bookshelves long, several windows and a woodstove wide. 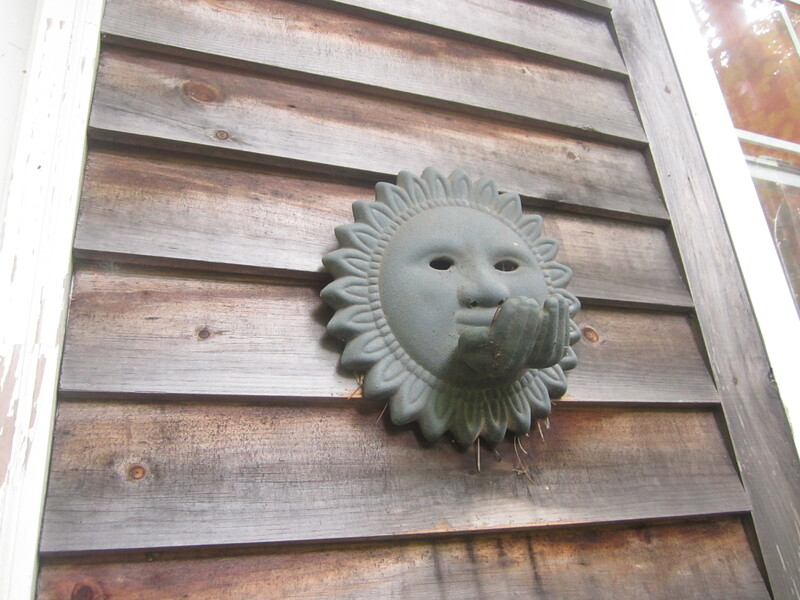 It sits down the slope of the backyard, nestled into the trees, behind the wide tangles of wild raspberries, down a path I have to re-hew every spring. It was erected in a little sunken spot already cleared of trees where there stood the hollowed upright totem pole of a single tree trunk with peeling layers of bark. I’d number the squat little cast iron woodstove, the untreated wood beams that span the ceiling, the door with its oval stained glass window, and even the unstained wooden siding among its amenities. The occasional foxes. And the quiet. And the many, many books. Why have a little writing house? How has it helped you write? After spending time at a few artist colonies over the years, I realized that space completely dedicated to writing was the way to go. I’d done my best work in these little alcoves. This particular space is modeled to some extent after a studio space I used at I-Park in Connecticut. In that studio, I wrote the first poems for the forthcoming book Body Thesaurus, while inspired by the visual artists there. I discovered what to do next in the energy of that space, and so I wanted to recreate that feel for my space here—a little heat source, a little white light, windows looking out onto long grasses and a sweep of trees. Additionally, this space is in my mind even when I’m not there. It grounds the work and lets it stay with me even when I’m physically absent. It is a place where things remain as I’ve left them until I return. There is a museum-like preservation so I can come back to re-see the evolution of an idea even when I leave it for a period of time. What has surprised you about the writing house? Mostly, I’m surprised that it exists at all. The entirety of it rests on a foundation of concrete posts that I watched my husband pour as liquid, singlehandedly, from a wheelbarrow into the ground. He ordered the wood beams and propped them across the ceiling. In late fall, as a last step once my son was born, he layered the roof, shingle by shingle, through the fog of lack of sleep. He would work after coming home from his job, and I would watch him out the window as the evenings got darker and darker and I would feel like I was watching a little space happen to preserve my former life from the very different place that my future life would be. These days, I am surprised as well by the cranky heat that won’t stay on when the temperature outside falls below freezing and the mildew that grows in the creases of the window panes and once, when months of writer’s block kept me away, even covered the surface of my desk. But also I’m surprised by how little I am there. This is a different life from the one I once lived. 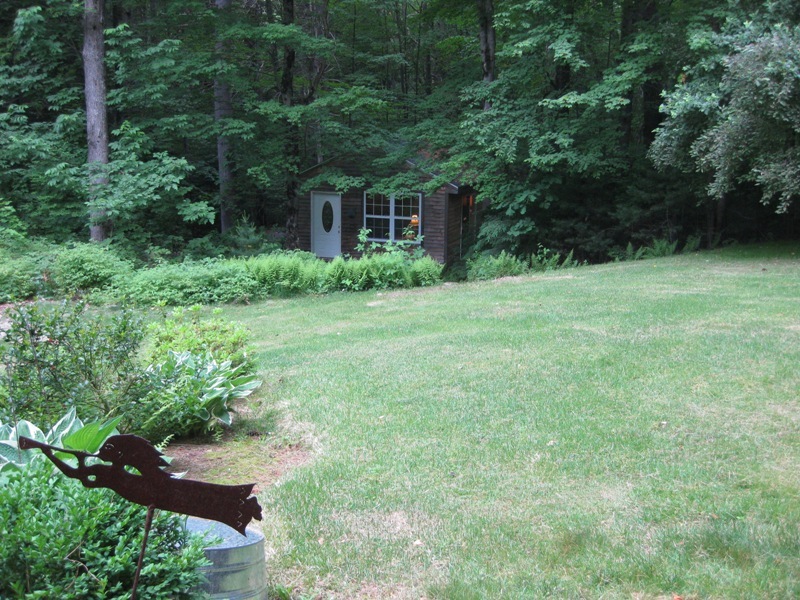 When I moved to this house, I had been living alone on over five acres of land, where all I did was write and teach and sleep, and where a writing space like this would have been redundant. Best/most necessary thing(s) in your writing house? Every single thing there is best. Every single thing is necessary. 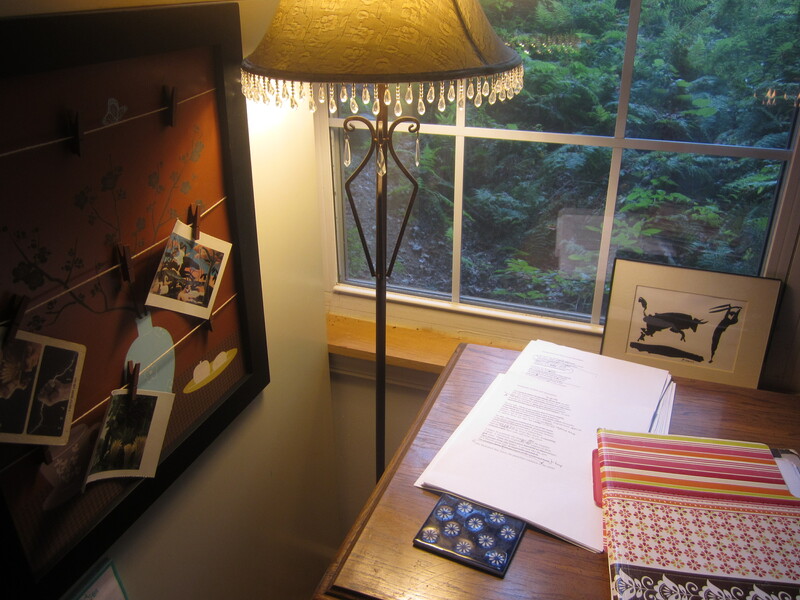 This room is filled with all the best and most necessary elements of my writing life. A woman’s dance mask I brought back from Africa. A lamp in the shape of two pastoral lovers that was a centerpiece in my grandmother’s apartment in Brooklyn until she died. The colossal desk I bought for $30 at a yard sale in Nashua, and the old childhood desk where I wrote my very first poem. Filing cabinets filled with old drafts that brought me over slow years of work to the poems I’m writing now. The typewriter and notebooks that lead me to the poems to come. The books that have shaped my beliefs, my thoughts, my dreams, my doubts. All this, and the reliable uninterruptedness. And the desk and chair and pens and walls and floor meant for nothing but that single thing. Any writing house “rules” or norms? A schedule? In terms of reliable writing time, Sunday mornings are it. I skip the family breakfast and before it is light amble down through the longish grass or crusted snow and turn the key, leave the woodstove going a bit before I commit to sitting and finding my way in. Other than that, there is too much clutter in my life to predict or stick to any one thing. I sneak away when I can. I write in places I never dreamed I’d write. I am forced to be a different writer than I was. So the study is the ideal. The reality is revising in the living room while the kids pretend they are jaguars and jotting down new ideas in the driver’s seat of the car between classes. But I have faith that someday I’ll be back to a routine. And when I am, that room, that very incredible and perfect room, will be waiting. What’s next for your writing house? I dream of built-in bookshelves. Someday. Right now I’m working on two projects: a series of prose poems set in a laboratory and a group of poems exploring the vast impossibilities of motherhood, Though neither project is far enough along to be in the commitment stage, I’m happy to have started this work, as I recently finished a manuscript and there’s always a period of searching and struggle after that until the next undertaking happens to venture along. Jennifer Militello is the author of Body Thesaurus (Tupelo Press, 2013), Flinch of Song (Tupelo Press, 2009), winner of the Tupelo Press First Book Award, and the chapbook Anchor Chain, Open Sail (Finishing Line Press, 2006). Her poems have appeared or are forthcoming in American Poetry Review, The Kenyon Review, The New Republic, The North American Review, The Paris Review, Ploughshares, and Best New Poets 2008. Her work has also been awarded the Barbara Bradley Award from the New England Poetry Club, the 49th Parallel Award from Bellingham Review, and grants and fellowships from the New Hampshire State Council of the Arts, the Barbara Deming Memorial Fund, and Writers at Work. Next postThe UVA Writers Workshop: 30 years and on…. “Every single thing there is best. Every single thing is necessary. This room is filled with all the best and most necessary elements of my writing life.” That’s exactly how I feel about my bedroom which, for me, as a young apartment dweller, is and has always been my preferred writing space. Every element is important; my chair and my desk, the colors and the smells, the windows and the sunlight, the artwork on the walls, my favorite picture of my mother, my books and my journals–they keep me afloat, keep me comfortable, and keep me safe while I wander in and out of all the dark dangerous places I go to while I’m writing. What a wonderful story and a lovely little house, especially due to the fact her husband built it for her.